Hi there; welcome back to our AutoDesk Inventor Video Tutorials series; we were just learning about how to migrate your materials and appearance data from a previous version of Inventor. 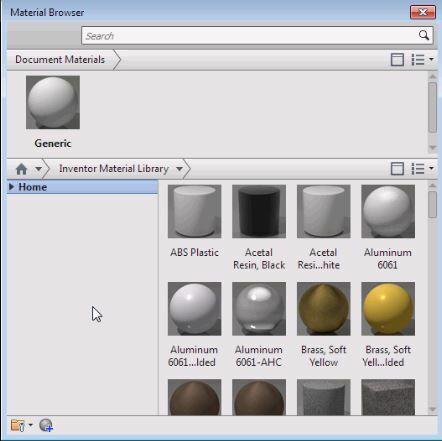 In our last article on this topic, we had just learned where to both view and assign libraries–Materials and Appearance libraries–in the Projects dialog window. (Remember, we get to the Projects window via the Get Started tab, and click on Projects). Let’s go to the first button in the left bottom corner. When you left click on the arrow to the right of the button, you can fly out the available commands. The main reason to migrate data is to use your custom materials and appearances in the current version of Inventor; otherwise you can’t. If you’ve got lots of good custom stuff you want to reuse, then you need to migrate your material and appearance data in this way. Then it’s available in your libraries for the current version of Inventor that you’re using. 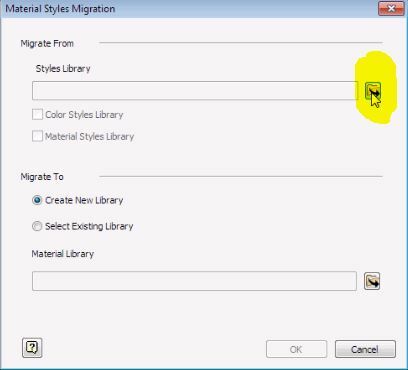 Under the Migrate From section of the window (the top pane), let’s click the Browse icon; I’ve highlighted it in yellow below. The Browse for Folder window opens, with the traditional Windows tree structure. 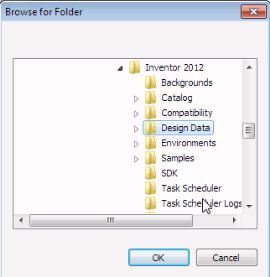 Let’s browse for and open Inventor 2012 > Design data. Just left click to select the Design Data folder, and then click OK.
Now we’re back to Materials Style Migration window, and this time we’ll work on the Migrate To section. 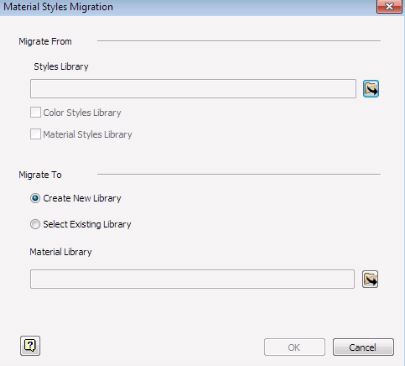 Let’s click the Browse button in the bottom pane of this window so we can go choose the library to which we’d like to migrate our Inventor 2012 design data.